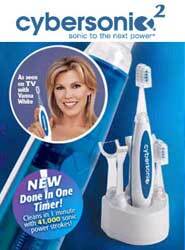 Introducing Cybersonic2® — a new technological breakthrough in sonic oral care for you and your family! This revolutionary system is a new and improved version of our popular Cybersonic oral-care system — with more convenient features than ever before! Its faster, easier to use — and combines 41,000 sonic strokes per minute with patented Cyberspring™ bristles — to take oral care to a higher power... Now youll be "Done-In-One™"... minute! Features spring-action bristles that custom fit the unique contours of your teeth, while deep cleaning at 41,000 strokes per minute. The brush head cap keeps bristles clean and sanitary! Brushes on just like toothpaste with no trays required. Sonic vibration produces kinetic energy that stimulates the release of oxygen – the active ingredient in Sonic White for whiter results. Makes flossing easy by holding the floss in the proper position – and by applying sonic power to create 41,000 up and down vibrations per minute. The pre-strung flossing heads are disposable, making daily flossing even easier! Works like a “mini carpet cleaner” across the surface of the tongue, removing bad breath at the source. The flat and narrow head is specifically designed to minimize the “gagging” reflex.